WHAT'S WRONG WITH YOUR FRAGRANCE? EVERYTHING. I've been wearing custom fragrances from The Fragrance Shop for over a decade. I enjoy the constant compliments about "smelling so good!" almost as much as I enjoy the beautiful fragrances. It doesn't hurt that refills are only a phone call away. Just wanted to say 'thank you' and let you know how pleased I am with my Jasmine oil. Your wonderful products, ease of ordering, prompt delivery and excellent service has been an added plus. Also, your hand written note made me feel more like a friend and not just another customer. I am really happy with my purchase, as I have bought your oils for over 6 years now. The price is great, the oils last a long time and I get quite a few compliments on my perfumes. Thank you again and I have been spreading the good word about your company. Received the order and the Dry Body Oil is delicious. I will post a comment-rating tonight on your website. The customer service is spectacular, could not ask for more. Thank you! Wow! Some of the most fantastic customer service ever and I was in retail sales for 20 years. I am about to tell everyone about your products and great customer service. Thank you so very much. Hope you have a great day and you just made mine much better. Not only was the service Awesome, every one of the scents stays on forever! I'm in the Navy, in Japan, and it still only took about a week to get here. 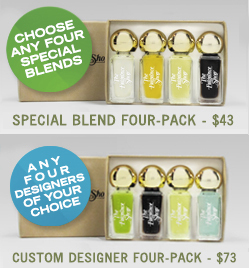 I ordered two Custom Designer 4-packs, and I get to wear whatever scent I feel like that day. Not only did this save me a bunch of money (as opposed to buying 8 bottles of expensive cologne), but the stuff smells way more consistent, and stays on much longer than alcohol-based spray colognes. I really couldn't ask for a better experience. I will be recommending this place to ALL my friends, both Navy and at home! Thanks so much! I cannot recommend this company highly enough! Their shipments come within 2 days of ordering and their customer service is the best in the industry! They always send the products thoughtfully and attractively packaged and I always get samples with each order! I will only buy my fragrances from you in the future! Let me say that I love the fragrances I ordered, as well as the 2 samples you sent me. I used the Dry Body Oil this morning after my bath and followed with my perfumed oil in the Hanae Mori. Fourteen hours later, I still smell great! ...Thank you for your great products and excellent service. Again, some of the most fantastic customer service ever and I was in retail sales for 20 years. Thank you and I am about to tell everyone about your products and great customer service. Thank you so very much. Hope you have a great day and you just made mine much better. Thank you for your excellent service for this time we received the package 4 days after it was sent to the UK . Well done !! We will be back!! It is nice to deal with a company that is so on the ball. I just love my purchases and wanted to thank you. The oils are beautiful and pure and the way they were packaged was fantastic...even the added touch of the Lifesavers was special. I'll be back again and again and again... thanks so much for a great shopping experience! Your fragrances are wonderful! My sister, mother and mother-in-law are now hooked on your products! Your packaging is always so personal and makes the customer feel special. 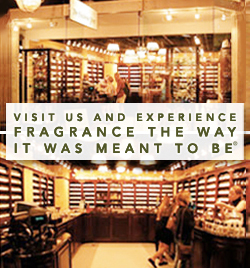 We really like your little samplers because it is fun to try the different perfumes in your selection. Thanks so much and I have told all my family and friends about you! I have been buying Wisteria from the fragrance shop since I visited their shop in New Orleans in the early 90's. Now, I buy over the phone when I run out. It could not be easier. They are pleasant and helpful and it takes moments. I would be lost without them.